Owned by Huafa Group and managed by Marriott International, the 10th masterpiece of St. Regis brand in Greater China will open next month in Zhuhai, the beautiful coastal city nicknamed the Chinese Riviera. 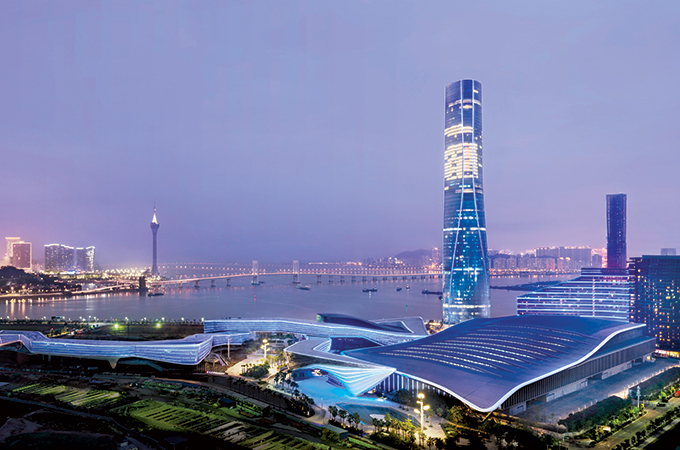 The St. Regis Zhuhai, in China’s southern Guangdong province, is located at the top from the 41st to 72nd floors of Zhuhai Tower, the iconic city landmark. With a breathtaking view of the vast Greater Bay and landscape of Zhuhai and Macau, the hotel features 251 exquisite guest rooms starting from 60 sqm and suites, which include a Presidential Suite of 1,100 sqm. An array of first-class restaurants and lounges offers incomparable dining experience at The St. Regis Zhuhai. Yan Ting is the opulent address for modern Cantonese fine dining, while signature restaurant Social draws inspiration from the first-class dining saloons on board cruise vessels typically set aside for the wealthy in the early 1900's. The St. Regis Bar exudes an aura of sophisticated mixology and elegant afternoon tea with classic jazz music. LaBrezza delights with organic, modern Italian fare led by Michele Tenzone, who has worked in 7 Michelin-starred restaurants in Europe, on the 71st floor rooftop, adjacent Air 71, serving an elaborate selection of drinks and light appetizers for memorable nights overlooking the panorama of the Greater Bay. The thoughtfully designed meeting areas offer a range of generous layouts and upscale amenities with the 1,500 sqm meeting space. Especially the 315 sqm St. Regis Roof, enjoying stunning river channel view between Hengqin and Macua's Cotai strip as an exceptional backdrop, is an ideal space for stylish weddings and private gatherings. Rare and refined, Iridium Spa on the 68th floor offers crafted indulgent moments with unobstructed view for guest treatments while The St. Regis Athletic Club is facilitated with state-of-the-art equipment and personal trainers for bespoke training that is tailored to guests' physique. In-door swimming pool and out-door swimming pool located on 69th floor and 71st floor are the highest pools in Zhuhai and Macau area by far. ZHUHAI serves as the gateway to Macau, as a tourist destination for Chinese, and as a playground for hedonistic visitors who come for its colourful nightlife. Zhuhai is known for its beautiful long coastline, waving palm trees, open spaces, low population density, and its many islands. Also known as the city for lovers and the city of a hundred islands, Zhuhai is a Special Economic Zone in Guangdong Province of China. The city of Zhuhai, literally meaning ‘Pearl Sea’, is on a delta, where the Pearl River flows into the South Sea. It also happens to be one of China's cleanest and prettiest cities, and has received numerous accolades for its excellent ecological development efforts. With a low population density compared to other larger cities in China and a subtropical climate, Zhuhai is quite green. The city is resplendent, with parks and open spaces, and waving palm trees lining the extensive coastline.